Since moving to Chicago almost three years ago, I’ve been running around the city trying to figure out how to make a life for myself. Initially upon our arrival, I decided I wanted to switch careers since I could no longer work in pharmacy and I didn’t want to do administrative work for the rest of my life. I decided to become certified as a personal trainer and see where it went from there. I was lucky in that Neil’s company paid for our relocation and helped us financially for a couple months following the move, so the amount of work I did was minimal. I started teaching fitness classes and continued to blog Monday – Friday. After awhile, for me, I felt like the household was unbalanced. I didn’t feel comfortable with the amount that I was contributing and I envisioned bigger things than where I had taken myself to this point. I looked for other opportunities such as freelance writing I could do at home and additional teaching opportunities. Slowly but surely over two and a half years, I took just about every opportunity I could until I was finally able to create two businesses that bring in more than I’ve made at any previous job. I’m still managing a fitness program for an employer, but after August I will be completely self-employed. Your goal may not to be to work for yourself and that’s absolutely fine. If that’s something you may want to strive for, however, here are some of the biggest things that have helped me over the past few years. As much as I hate networking, I’m always reminded how valuable it is when I discover potential opportunities with other people or learn information I wouldn’t have otherwise known. I’m what you’d term an “extroverted introvert” in that I have the ability to be outgoing and personable with a number of people, but when I’m done, I’m done. I’d rather not talk to people if I don’t have to, but I almost always walk away with a new piece of information or meet someone who could help further and improve what I’m already doing. This is why I know it’s important. Some of my biggest opportunities have been from reaching out or asking questions to people I barely know. Honestly, creating a life for yourself involves work. A lot of work. Consider yourself a start-up minus the capital that comes from outside investors so that you can earn a regular salary. It’s all you baby. I still work an average of 60 hours a week, but the payoffs are larger. I am no longer riding the train a total of 60 min to train a client for 30. I can afford to not wake up at 4 am or be committed every Friday evening to teaching classes, but I did that for a couple years because I needed to. In any business where you work for yourself, you have to do what you can with what you have in order to grow. Figure out what your priorities and goals are and then figure out what you need to do to get there. It’s going to take work. If you’re upset that other people are more successful than you, don’t whine and complain about it, take a look at yourself, figure out what you need to do differently, and put in the work to get there. Comparing yourself to someone else is time you could be using to be better than you were yesterday. A common theme I see in a lot of successful bloggers is that they plan. And plan. And plan. They’re not flying by the seat of their pants; they think about the bigger picture, they plan content, and they strategize in order to grow. Because I make an income from both blogging and personal training, I need to structure my weeks so that I can do both. I know I don’t write well if I also have clients throughout the day because it leaves me feeling scattered mentally. Because of that, I have significant chunks of time blocked off so that I can concentrate on one thing at a time. Thankfully, being in recovery taught me how to do this, but I know firsthand how hard it can be to ask someone else for help. It’s tough to admit that you can’t do everything on our own, but if you’re going to grow, you have to let others help you. This year I finally hired an accountant because I was overwhelmed with my finances. Without doing that it would have been MUCH longer before I incorporated my businesses, if ever. When I needed help on this site, rather than Google how to code something myself and inevitably break it, I asked people who knew about programming and web design. Find people who know how to do the things you can’t. It will free up time for you to do what you do best. 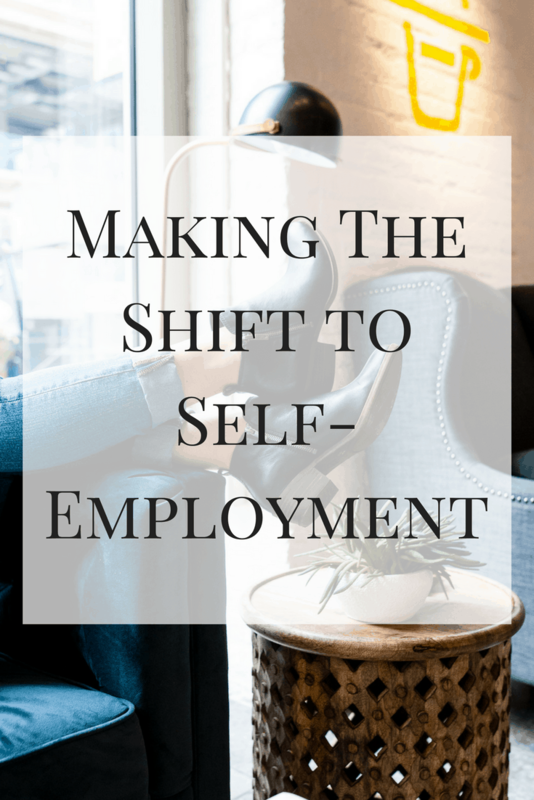 Ultimately, making the shift to self-employment involves being practical about what is and isn’t feasible. It’s thinking about the big picture and knowing that no matter the ups and downs, as long as you stay confident and committed, you’ve got this. I’ve always wanted to try freelancing and being self-employed full time, but I don’t think I have enough life experience as of yet to try and tackle that! Maybe some time in the future. Thank you for your tips, I’m taking them to heart! This is so awesome Erin. I know you put in a lot of hard work and it’s great to hear how far you have come over the last couple years. Very exciting. This is was so good to read your experience and guidance. I’ve been freelancing for awhile but still maintain my full-time job. At some point I hope to switch over completely! Love these lessons. I’m not probably going to be working for myself, but it is so good to get inside what an entrepreneur is learning and thinking. You are so well equipped for it Erin! This was great Erin, and so on point with basically everything I believe in too. So many people don’t realize HOW MANY HOURS it takes to get to a point where you can proudly say you’ve created something yourself AND earn a living from it. Boundaries are so key too – I find that sometimes i’ll break on them and I feel so dumb about it later. Such good advice and I agree with every bit of it. I think planning and doing what works for you is always key. So many fly by the seats of their pants not having a clear direction. I know I did that for awhile and it wasn’t fun. Great tips! I am also an extroverted introvert – If I’m comfortable around you, I’ll more outgoing but I have to warm up to people. And yes – let me be alone after hours to recharge! Love the focus that you have to have your boundaries – that has helped me so much. This was a very enlightening blog post! Thank you for sharing, Erin! I also just read a bunch of your other blog posts and they are fantastic! These are great tips! I hope to earn at least a side income from my writing one day, but I don’t think self employment is for me. Or at least it’s not in the cards any time soon, and that’s ok! I enjoy the routine of my office job, even if it’s not my passion, per se. It’s inspiring to see how you’ve built up your blog and training businesses, though! Thank you for this post. I am at a crossroads right now and some of these tips will definitely help me go in the direction that I want to. I love this post. Starting a blog is something I have always wanted to do but I just have never pulled the trigger to do so….I am also 100% an extroverted introvert – I can be on my game and talk with people all day (even though I hate small talk) but I have a lot of anxiety about it before I get there and then after I am exhausted! I’ve been following your blog for a little while and have even responded to your Insagram stories about animal cracker obsessions (Teddy Grahams over here), and I just want to say that 1. I feel like I know you and 2. This was some valuable info. I currently work full-time, and although it’s a writing job, it isn’t *my* writing job. I love my blog and want it to continue to grow and hopefully become a full-time thing. The community seems welcoming and wonderful, and I appreciate this insight on hustling and networking and retreating to your own little corner of the world to recharge. Your honesty is TOPS. Keep it up. As always, it’s a pleasure to read you. I love the way you describe things easily with structure at the same time. I have two part time jobs, my regular and my blog (that I call my little baby… it’s literally how I see it, my biggest project) and I’m always struggling between both. Working for yourself is hard, much harder than anyone else with a 9am-5pm job would think. I think you are doing amazing, finding balance between exercise, the blog, your personal life, and so much funny content on your social media! Keep up the good job, we love you the way you are. Oh, and by the way I was happy to read you as I’m also an extrovert-introvert and even if I know networking is important it’s always a challenge to me. We should meet again some time! This has always been a goal of mine! I’m finding it difficult to balance between a full-time job, a part time job, trying to freelance and blogging, but I’m hoping that I will be able to make that jump soon. This article was exactly what I needed to focus in this week and stay motivated!